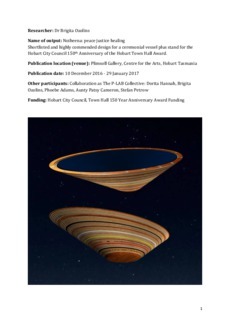 P-LAB addressed the award brief by designing a ceremonial vessel that represents a coming together of Hobart’s multi-layered history through the merging of indigenous and introduced timbers, steel and acrylic. Titled Noiheena, a local Aboriginal word referencing the sun, ‘good spirit’ and sparks in the night sky, the vessel is dedicated to peace, justice and healing and can be used for cleansing space with vapours from native plants. The design was inspired by striated mussel shells, water carriers, boats and canoes, as well as the growth rings on tree trunks. As a guardian figure, Noiheena was designed to rest on a stand on the landing of the Town Hall’s central staircase but can be moved to enact its ritual task.